The discovery of Pluto's tiny new moon — announced July 20 and called P4 for now — brings the number of known Pluto satellites to four. The find, made with the Hubble Space Telescope, suggests that NASA's New Horizons probe could make some big discoveries, too, when it makes a close flyby of Pluto in 2015, researchers said. When New Horizons' imaging of Pluto is done, scientists hope the spacecraft can investigate one or two other objects that — like Pluto — are in the Kuiper Belt, a ring of icy bodies orbiting far from the sun. "The discovery of P4 just reinforces what we knew before: This is going to be completely new territory," said Hal Weaver, New Horizons project scientist at the Johns Hopkins University Applied Physics Laboratory. "We can't wait." The New Horizons spacecraft launched in January 2006 on a mission to study the faraway Pluto system, which has never been visited by a probe. 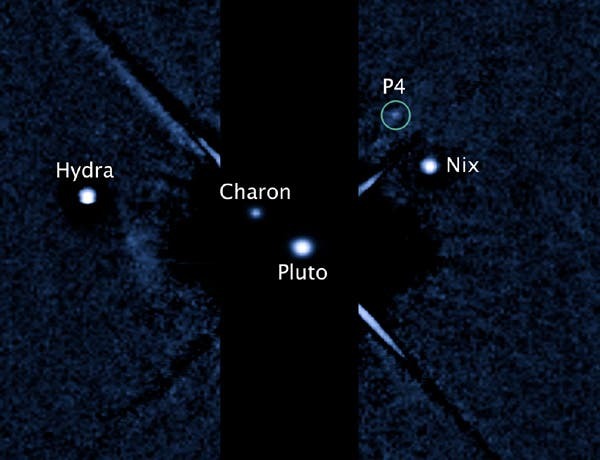 That system is now known to harbor at least four moons: Charon, Nix, Hydra and P4. Since its launch, New Horizons has traveled more than 1.8 billion miles (2.9 billion kilometers), and it's slated to make a close pass of Pluto in July 2015. "We obviously want to pay attention to it," New Horizons principal investigator Alan Stern, of the Southwest Research Institute, told SPACE.com. "But it's not going to reshape the basic concentration on Pluto and Charon, and also Nix and Hydra." The newly discovered moon supports the theory that Pluto had a violent past. The system probably formed after a massive collision between two Pluto-size bodies about 4.6 billion years ago, Weaver said. The dwarf planet's satellites likely coalesced from the debris flung into space by this cosmic smash-up. Scientists found P4 using NASA's Hubble Space Telescope during a search for possible rings around Pluto. Hubble also detected Nix and Hydra back in 2005. New Horizons was designed to unlock some of Pluto's unsolved mysteries — what it looks like, what it's made of and the nature of its atmosphere, for example. The image above provided by NASA combines two labeled images of the Pluto system taken by the Hubble Space Telescope's Wide Field Camera 3 ultraviolet visible instrument with a newly discovered fourth moon P4 circled. Pluto's new moon needs a better, more evocative name. Right now astronomers are using two boring designators for it – P4 and S/2011 P1. What would you name it?